As I wrote many times, I try to use as much as possible my iPad at work. But many times I fail to use my iPad, because it does not support certain enterprise applications. Microsoft does not yet do a good job to support other browsers than Internet Explorer. Our IT operation department is using LogMeIn for user support and lucky wise there is an iPad version of LogMeIn available. 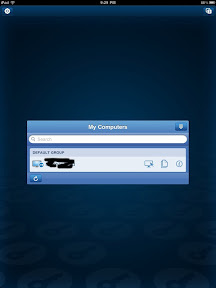 My IT operation team loves LogMeIn for PC, therefore I decided to give it a try on my iPad. First you have to create on the LogMeIn website an account, if you don't have one. Does take only a minute. You only need email and password, this is all. 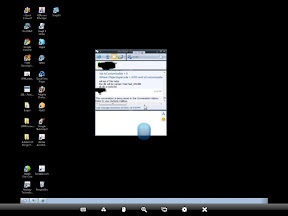 Next you have to download a LogMeIn app for your PC which you want to share with the iPad. This was pretty easy and fast too. I had some issues to get LogMeIn correct configured. It said it is running but no network available. My It operation team did help me with this. You only have this issue, if you install it on a very secure network as we have. Next I bought the iPad version of LogMeIn. It is not cheap ($29.95) but if it works well, then it is a good investment. Installing the iPad version was simple. Just download it and then start it. 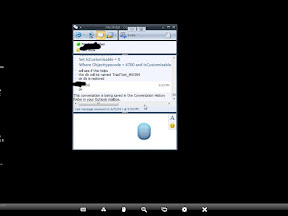 You have to login with your LogMeIn account and then you see the computers which you are allow to share. In this case my company computer. I had to log in to my computer with my username password of the computer (not LogMeIn). This is all. It takes approx. 10 seconds till the screen is there. LogMeIn has some cool functions. 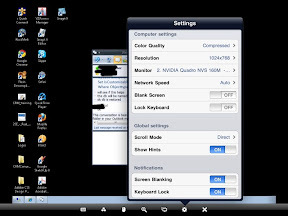 If your computer has more than one screen than you click through them instead showing both screens on the small iPad screen. You have some extra buttons for keyboards (two different), "ctrl Alt del" button, zoom, settings, mouse and end session. 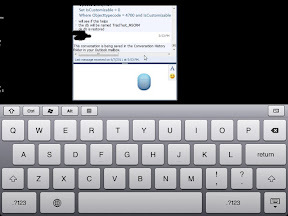 The iPad of course has not all Windows keys available and therefor comes the second keyboard handy. Top right is the button to switch the keyboard for special keys like delete. The zoom function is nice too, but you can only zoom one level in. The settings are great, you can switch the resolutions per screen, you can change color depth and network speed. Btw you see on the picture above a blue mouse, this simulates on the PC your mouse for clicks etc. You right and left click, drag and drop. You need some practice but then it works just fine. I tested LogMeIn over Wifi and 3G. With 3G is not much fun but better than if you have only one Wifi bar. The speed is very acceptable over Wifi with full bars. Still not as fast as on the computer but the delays are really no problem. 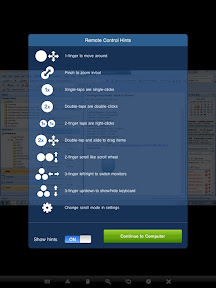 LogMeIn explains very nice how to use your gestures to work with. I tried the pinch to zoom and could much more zoom than the zoom button. Another really good feature is that you can use the LogMeIn file manager. 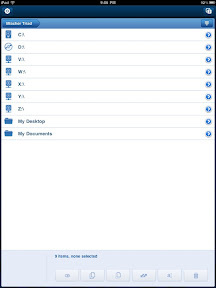 With the file manager you copy files from your iPad to your computer and vice versa. Each screen shows on top right a number, which indicates how many windows you have open. In my case the LogMeIn screen, my PC screen and my file manager screen. It is really easy to use file manager. 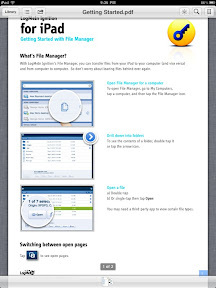 You local file manager folder has a PDF which explains how the file manager works. You can even open the file in iBooks if it is PDF or in numbers if it is an excel and so on. 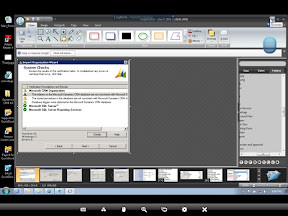 After using a while LogMeIn I figured, that I use most of the time the file manager to open or copy documents instead of the remote screen access. Just because I only need the screen of my computer when accessing a software which does not work on the iPad. I still use for Mail, calendar and contacts my native iPad apps. From all apps I tested in this spectrum is LogMeIn the best and I surely will use it a lot. 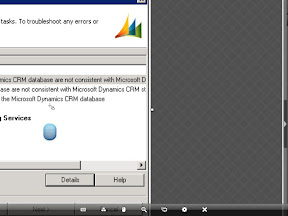 The only issue I encountered was the session end problem. LogMeIn does hang up many times and I have to kill it manually. Otherwise 4 thumbs up. Yeah, LogMeIn is a decent service, but I've gone with RHUB's remote support servers setup because it provides six collaboration services in one setup.